On 22 June 1941 Nazi Germany attacked the Soviet Union. The Treaty of Non-Agression, the Molotov–Ribbentrop Pact, signed by both Nazi Germany and the Soviet Union on 23 August 1939 was dead. This treaty had a secret protocol which divided Poland into German and Soviet areas of occupation. The Soviet Union had invaded Poland on 17 September 1939 and had deported over 1 million Poles to Siberia and other Soviet territories. They had also captured around 250,000 Polish Army prisoners of war. The Soviets held 15,000 Polish Army officers in three special camps at Kozelsk (Russia), Ostashkov (Russia) and Starobelsk (Ukraine). The German attack on the Soviet Union led to Stalin granting an amnesty to all Polish prisoners and deportees. General Wladylsaw Anders, a Polish Army general, was released from captivity in the Soviet Secret Police (NKVD) Lubianka prison in Moscow. He was then tasked by the Polish government-in-exile in London with the job of forming a Polish Army in Russia. Polish prisoners were released from camps all over the Soviet Union and tried to find their way to Buzuluk, in the southern Ural Mountains of west-central Russia, where the Polish Army was being reformed. One of the first problems, among many the general [Anders] had to face, was the organisation of this multitude, the influx of which ran into thousands daily. Anders needed officers badly, but officers rarely appeared. Of 14 Polish generals captured by the Soviet Army only two appeared, in a state of exhaustion; the remaining 12 were missing. From 300 high-ranking staff officers only six came to Buzuluk, and there was no news of the other 294 missing. After the influx of men finally stopped and counts had been completed, there were about 15,000 missing persons, among them 8,300 to 8,400 officers. Where were the missing Polish Army officers? General Anders established a search unit to try and locate the missing men. On 13 April 1943 Berlin Radio announced that mass graves had been found in Katyn forest, near Smolensk, Russia, containing the bodies of thousands of Polish officers. The Germans said that the Polish officers had been murdered by the Soviet Union. The Soviet government immediately denied that it was responsible. 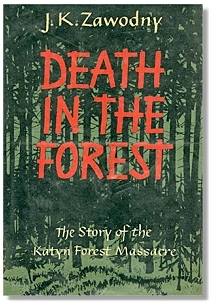 Until the summer of 1941 the Katyn forest area was controlled by the Soviet Union. After this date the German army took control. If it could be proved when the men were murdered then those responsible for their death would be known. An International Medical Commission and a report by the Polish Red Cross both concluded in May 1943 that the men had been killed in the spring of 1940. The Germans retrieved thousands of letters, ID cards, photographs and other personal possessions from the bodies of the murdered Polish officers. They were placed in nine large wooden cases and sent to the Polish Insitiute of Forensic Medicine in Krakow. The Poles decided to build 9 wooden boxes identical in appearance to those in which the materials were stored...idea was to transfer surreptitiously the materials from the "German" boxes into the "Polish" boxes and then, in great secrecy, to submerge the cases in a lake...German guards discovered the plot...Soviet forces were already entering eastern Poland...boxes moved west towards Germany...to Breslau...Breslau was taken [by the Soviets]...Soviet security police were on the spot looking for the boxes. So was the Polish underground...in the very last days of fighting for the city the SS took the boxes...and headed west...eventually the boxes reached the town of Radebeul between Dresden and Meissen. It was impossible to proceed further...boxes stored at Radebeul railway station with an explicit order to the dispatcher that in case of approach of Soviet units, "the boxes be burned completely"...the forwarding agent, immediately prior to the Soviet entry into the city, set fire to the boxes. It is assumed that they burned to ashes. It was not until 13 April 1990 that the Soviet Union finally admitted that the Soviet Secret Police (NKVD) had been responsible for the murder of all 15,000 of the Polish officers. Publisher - Published by University of Notre Dame Press, Indiana, USA. Originally published in 1962. Hippocrene Books published a reprint edition in April 1988. This page was added on 12 September 2009.